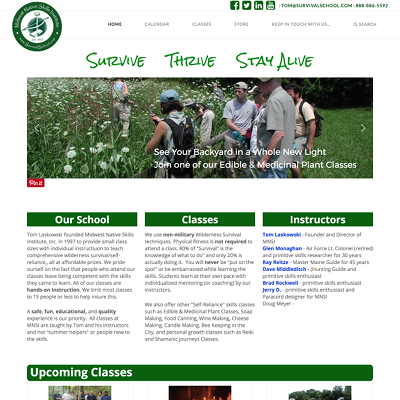 Tinderglow Consulting has been working with Midwest Native Skills Institute since 2009 when Tinderglow's Chris Chernesky took a Survival 101 class from Tom Laskowski. Since then, we've gone through a few different interations of the site, each a little more successful than the previous. 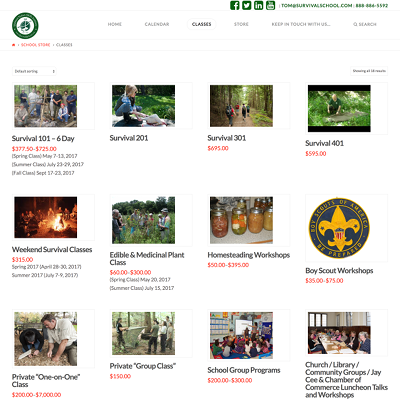 When we sat down to figure out what we wanted to do this latest iteration, we found that WordPress would be a perfect fit for how Tom works and WooCommerce was a natural extension of WordPress for the survivalschool.com store. Please feel free to look around the tinderglow site. In addition to working with small businesses and WordPress, we work for companies and non-profits of all sizes in technologies as diverse as Ruby on Rails, Angular, Phoenix/Elixir, Meraki and Ubiquity networks, and Amazon Web Services. We were able to create a site for MNSI that is not only attractive and easy to change, but has resulted in a boost in sales and compliments from customers. Tom is much more in control of the site and is able to make changes at his pace. Integrating WooCommerce into his site has enabled him to do much more with his products and also control his sales in a way that he hadn't been able to before. We also streamlined his payment processing and made it a much more comprehensive solution. Tinderglow also has created a number of customized video tutorials for MNSI to be able to reference regarding the various features of the site. Tom has commented multiple times that these are very valuable for him and help with site maintenance.